Your outdoor drain system protects your home by carrying wastewater away. When you encounter a clogged pipe or a sewer line problem, it’s important to hire a Bethlehem or Allentown plumbing professional to diagnose the clog and restore pipe performance. Our Lehigh Valley plumbers are equipped to find the source of the problem using mechanical equipment, camera inspection, and other solutions. Once we have located the source of your blocked sewer line, bathroom drain or storm drain, we use augers, snakes or a trailer-mounted jetter to remove obstructions like grease buildup, pipe scaling and sanitary products. When drain clogs are past the plunger stage, Elek’s award-winning team is quick to respond. If a drain snake or auger is not the best solution, we may recommend a hydro-jet to clear the lines. During Lehigh Valley hydro-jetting, Elek SuperSTARS use a high-pressure hose to inject a powerful stream of water into pipes and cleanouts. Once jetting is complete, we re-inspect the lines to ensure they are clear. When your business suffers from a plumbing problem, it means downtime and lost revenue. Invest in your commercial plumbing system with an Elek Commercial Maintenance Agreement (CMA). During routine visits, our team will pinpoint possible problems and restore performance to slow-moving drains before they become a costly problem. Depending on your plumbing system, we utilize cabling and hydro-jetting to remove sludge and debris and open blocked lines. When clogs or backed-up sewage systems threaten to damage your home or business, ask Elek about high-pressure cleaning and other proven drain services. 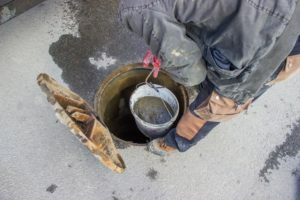 After completing a visual inspection and providing upfront estimates without hidden fees, your licensed plumbing technician will recommend the best way to remove drain clogs from outdoor pipes, commercial facilities, or home plumbing systems. Overflowing toilet or plumbing emergency? We’re here 24/7 for your peace of mind. Call 610.432.7001 to connect with an Elek technician and schedule fast, friendly service that safeguards your health and gets plumbing up and running in no time. Coupon not valid for installation of customer-supplied products and cannot be combined with other offers. Standard Service Charge applies. Coupon must be presented at time of service. Valid through 03/31/2019.